Hypercard—or at least its look and feel—is alive and well in King Midas, a book app for the iPhone and iPod touch aimed at the preschool set. The familiar story of the king whose wish that everything he touches turn to gold turns out to be a disastrous one comes slightly to life in this moderately interactive retelling of the tale by Decode Entertainment. The Midas Touch: Touching one of the red roses on this King Midas screen turns the rose to gold. The app could use more interactivity like this. 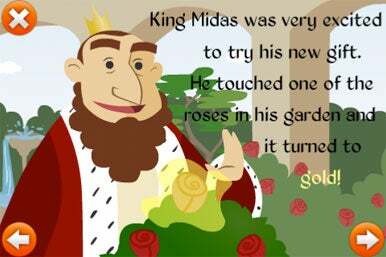 There’s nothing wrong with King Midas. The illustrations are top-notch, while the narration is well-pitched for a three-year-old. That said, there’s little to recommend this instead of, say, a cardboard-and-paper book version of the same story. The developer has done little with interactivity; on some screens you touch somewhere, and something happens—a flower turns gold or a child laughs. But on other screens, nothing interactive happens—an inconsistency which would frustrate many pre-schoolers. Another feature the app provides is the ability to replace the provided narration with your own voice, providing you have a microphone. Some parents might find some value in reading to their kids, iPhone-style.